An attractive example of an old Scottish burgh in West Fife, situated on the River Forth seven miles west of Dunfermline. Created a royal burgh in 1588, Culross was the legendary birthplace of St Kentigern, or St Mungo. An abbey was founded here in 1217 by Malcolm, 7th earl of Fife, and during the 17th century salt panning, coal mining, weaving and trade with the Low Countries from the foreshore port of Sandhaven were developed, chiefly by the enterprising local merchant Sir George Bruce. Another famous product of the town at that time was the iron baking girdle. The town is rich in 17th and 18th century cobbled lanes and buildings, many of which have been restored by the National Trust for Scotland. Amongst the main historic landmarks are: The Palace, built by Sir George Bruce in the 16th century; 13th century Culross Abbey, a Cistercian foundation; the Town House (1626); and The Study (1633) with its corbelled top storey. Culross Palace. This charming mansion was built between 1597 and 1611 by George Bruce of Culross, a wealthy merchant who was knighted by James VI. Its crow-stepped gables, and pantiled roofs have long been a favourite subject with artists, while the painted ceilings are as fine as anything of their kind in Scotland. Adjoining the Palace is a terraced garden, pretty with flowers. Culross Abbey. This Cistercian monastery was founded by Malcolm, Earl of Fife, in 1217. There remains of it the choir, still used as the parish church, and parts, more or less, of the nave, the cellarium, the frater and the dorter. Only the south wall of the nave belongs to the early thirteenth century; the rest of the buildings date mostly from about 1300, and were again reconstructed in the reign of James IV. The rood screens and pulpitum are of particular interest. The fine central tower, still complete, bears the arms of Abbot Masoun (1498-1513). Culross was a daughter-house of Kinloss, in Moray. John Buchan's classic spy thriller the Thirty-Nine Steps, starring Rupert Penry-Jones. 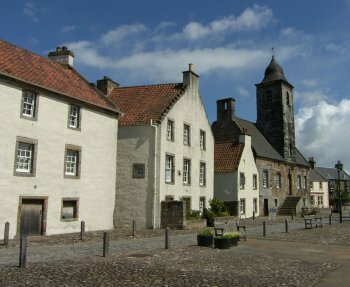 has partly been filmed in several locations in the village of Culross, including Culross Palace, the Town House, Ginger's Yard, Haggs Wynd, Back Causeway, West Green, and other parts of the town. The first object of any interest in this tract is the town of Culross the site of an abbey. The Abbot of Culross is named in the sederunt of 5th November, Culross, an abbey situated on the Forth, near the town of the same name. We reached Culross at night, where I directed the ensign and all the men to secure three or four rebels, who were in the place.